Between 23rd and 30th January 2017, Workforce Scotland held the Fire Starter Festival, a week-long festival of collaborative learning events, illuminating creative, disruptive and innovative ways in which we can all transform ourselves, our organisations and the wider system. The First Minister has provided a clear commitment to empowering individuals and communities to become involved in designing public services. Many people across Scotland are currently lighting their own small fires by exploring genuine, participatory methods of engagement, creating innovative and trans-formative changes. PAMIS decided to light a storytelling fire and invited college course leaders to attend the event to discuss how creatively together we could embed storytelling opportunities into college course for people with learning disabilities. Representatives from Fife and Perth colleges attended alongside Amanda Scott from Angus Education to see first hand how storytelling can help transform individuals and enhance their self esteem, confidence and learning. 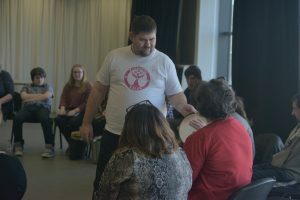 The apprentice storytellers from Tayberry Tales demonstrated their skills and hosted a fantastic fire starter event aimed at supporting discussion about storytelling becoming available as an option offered within the further education curriculum for students with learning disabilities.